The Salt Lake Community College men’s basketball team experienced a full range of emotions in 2017-18. A historic 30-win season was something the Bruins can be proud of, but an early exit in the NJCAA Tournament left the team with a feeling they weren’t used to often: the agony of defeat. Despite the setback, Phillips says the loss still provided valuable teaching moments. The team felt the joys of victory just a couple weeks before the NJCAA Tournament with a Region 18 title win on the road and a home victory over Arizona Western College in a district playoff game. The season should be considered a success with how the team dominated the regular season and the Scenic West Athletic Conference tournament. When the Bruins entered the regular season, they were an astonishing 16-1, with their only loss at the hands of Mesa Community College just a few days after Christmas. The Bruins proceeded to mop the floor with the rest of the conference, going 10-2. The combined scored from the two Bruin losses is a total of six points. Defense was the identity of Coach Phillips’ squad this year. His defensive anchor was Kur Kuath, a 6-foot-9 big man with a wingspan that seemed to span the length of the Jordan River. Kuath was among the top shot blockers in the country, earning himself a scholarship to the University of Oklahoma. And in front of Kuath was his former high school teammate, Bushmen Ebet. Ebet is an athletic guard who used his speed to pick off passes and rack up steals for the stingy Bruins defense. SLCC will have to replace their entire starting lineup from this season. Phillips is losing sophomores Kuath, Ebet, Christian Gray, Isaiah White, Dalvin Brushier, and Alec Monson, but he has tremendous faith in the freshmen from this year and the incoming class. The roster turnover rate for two year colleges is naturally fast, so look for next season’s Bruins to be a different looking team. 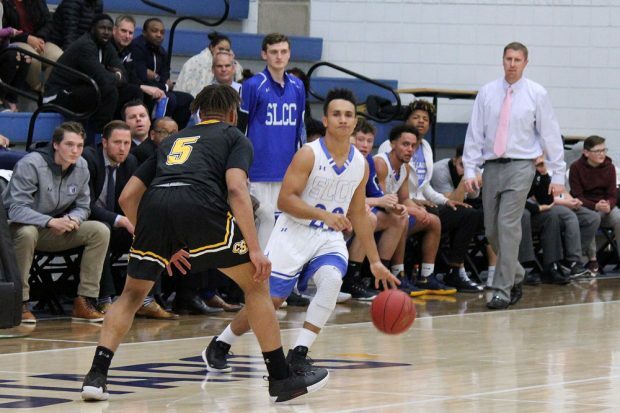 Defense might not be the calling card for SLCC; it could be talented offensive unit with good three-point shooters. Lindsay off the bench was the team’s best sharpshooter at times. Colon is lightning quick with the ball in his hands and can get to the hoop at will. Schofield is a high motor rebounder with size and a nice back to the basket game. The 2018-19 team will grow over the course of the season, and aim for another trip back to Hutch for the NJCAA Tournament.